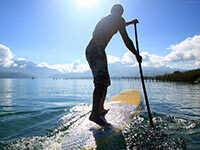 WATER SPORTS | Annecy & Lake Annecy : hotel, camping,résidence, location or restaurant around lake Annecy. 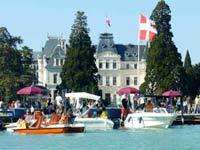 Lake Annecy is an ideal playground for water sports and other leisure activities. Come and relax on one of the 11 beaches around Lake Annecy where the water is around 24°C in summer. Public beaches are supervised from 1st July to 31st August. Some are free of charge, while others have admission fees. Lake Annecy is perfect for water skiing, wakeboarding and wakesurfing. There are so many activities for thrill seekers to try ! Mornings, or evenings before the sun sets, are great when the lake is calm and there are fewer people around. Whether it be on a sailboat, catamaran, windsurf or kitesurf, sailing has always been popular on Lake Annecy. Watch out for the 'bise', the north wind that blows for 3, 6 or 9 days... and be careful when the 'Favergien' comes, the wind from the south which usually precedes bad weather but makes for great sailing! Canoeing, kayaking and paddleboarding with friends and family are all great ways to discover the lake, explore the shorelines and admire the untouched landscapes. Rental equipment and advice available at "Roul’ ma Poule" in Annecy-le-Vieux throughout the summer. Lake diving is completely different to scuba diving in the sea. However, it is just a spectacular! Experienced divers can visit the wreck of "La France", a boat which sunk in 1971 and now lies at a depth of 140 feet off the shoreline near the village of Annecy-le-Vieux. For those wishing to discover the sport or improve their skills, there are a number of diving clubs offering inductions and courses throughout the summer. And if you don't fancy diving under the water, why not try snorkelling in the shallows!. Lake Annecy offers a range of possibilities for boat rides with friends or family. There are numerous companies around Lake Annecy offering boats to rent, some requiring a boat licence. If you have your own boat, there are 9 docks available offering seasonal mooring rings: Annecy, Annecy-le-Vieux, Doussard, Duingt, Menthon-Saint-Bernard, Saint-Jorioz, Sevrier, Talloires and Veyrier-du-lac. More information can be found at the local Town Hall. And like on the roads, boating is subject to strict rules which must be observed.